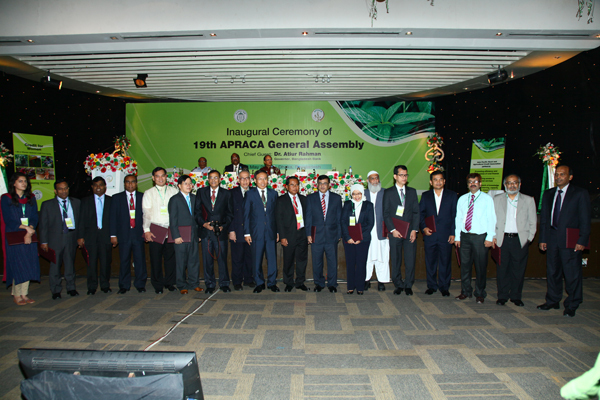 Asia Pacific Rural and Agricultural Credit Association (APRACA) ‘s 64 EXCOM, 19th General Assembly and its Subsidiary Meetings were held on 18-21 May 2014 at Radission Hotel, Dhaka Bangladesh. Mr. Abdul Karim, Managing Director of PKSF joined the 64th Executive Committee (EXCOM) Meeting on 18 May 2014. Recently PKSF has enlisted as a new member of APRACA. In 19th General Assembly meeting Mr. Golam Touhid, Deputy Managing Director (DMD) of PKSF has received a membership certificate from APRACA on behalf of PKSF. During the period of 20-21 May 2014 Mr. Akond Md. Rafiqul Islam, General Manager (operations)-CC; Mr. Dilip Kumar Chakravorty, Assistant General Manager (Operations) and Ms. Tanvir Sultana, (Operations) actively participate the Regional Policy Forum on Risk Management for Smallholder Farmers and Communities organized by APRACA at Radission Hotel, Dhaka Bangladesh. On 22 May, 2014 a delegation of APPRACA joined in a short meeting with Mr. Touhid, DMD of PKSF at PKSF Bhaban.